Looks to be a brand new addition to the land survey (revision) fleet on the Canadian Prairie, circa 1922. Captioned "Ford truck used on revision work." I love how these old pictures can show the most utilitarian body imaginable yet they still had some guy pin stripe the thing. Can anyone tell if that is a low hood (1917-22) TT or later ? My question; were pneumatic tires available on the TT from the start ? Most of the photos of the easiest ones show them with solid rubber tires. I have to remind myself that statistically, 1924 was the high-water mark for draft horses in this country. Most likely, whoever made that bed for the truck was also building farm wagons, and the traditions of painting and striping horse-drawn equipment carried over, of course. For what it's worth, those are "broad stripes" on that bed. I have an 1880s manual on carriage and wagon painting that has a whole chapter on striping, scrolls and lettering. It defines about a half-dozen different breadths of stripe by their width, and indicates their "proper" placement and uses. According to that book, a "pin stripe" is the narrowest one - the width of . . . a pin ! Note Dale often posts photo of Canadian Fords. 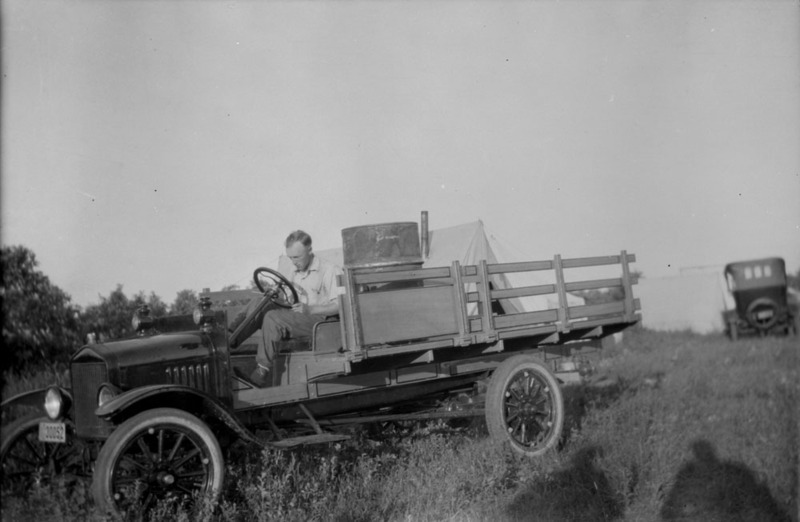 I believe that is the case here as he shares, "land survey (revision) fleet on the Canadian Prairie, circa 1922." And because of that -- our USA information may or may not be that helpful on a Canadian produced car or in this Ton Truck. I believe we can look at the steering column and see that it has the horn button on top of the Steering column. That would be typical late 1915 to late 1917 for USA manufacturing. But Ford of Canada continued that horn button on top of the steering column on "Cars" until around 1920 when they introduced the one man top and placed the horn button on top of the steering wheel with the wires dangling under it. It would have been easier to switch them all at the same time -- but I don't know if the did the cars and Ton Trucks around the same time or not. "IF" Ford of Canada did the Ton Trucks around the same time as the Cars and "IF" I actually see a horn button mounted on the top of the steering column, then the Ton Truck in the photo would be an early 1920 or earlier Ton Truck. And "IF" that was the case, it would be a low hood truck. Your question of, "...were pneumatic tires available on the TT from the start ?" Pneumatic REAR tires were not listed for the USA TT until 1919 in the 7th Edition MTFCI Judging Guidelines. So the initial 1918 (and 3 1917) Ton Trucks would have come from the USA factory with solid rubber tires on the rear wheels. The 1922 Canadian Price List of Parts agrees with the USA information. They show only the solid rubber tire for 1918-into 1922 (remember it is a 1922 Price List so nothing is listed beyond 1922) and the 32 x 4 1/2 demountable is shown used from 1919-1922. As always a higher resolution photo (or better eyes on my part) would probably help with the identification. Poor guy looks to have had a long day. Is he taking a nap? There also appears to be two shadows supervising the operation. I think he is looking down thinking to himself, "Why are there three pedals down there?". It is a low hood car, as there is no apron covering the front frame cross member. The kerosine side lights were retained on cars/trucks with no starter/generator, which was often the case with truck chassis. I can see nothing to indicate that it is NOT a 22 model, but it could well be earlier.